German Donaldist Jürgen Wollina has released a map of the fictitious town of Duckburg that he has worked on for the last 13 years. Every detail on the map is based on something from a Carl Barks comic book story. Carl Barks wrote and drew thousands of pages of Disney comics from 1942 to 1966 and created Duckburg as well as Scrooge McDuck, the Beagle Boys, Gladstone Gander and many other characters. Donaldists are fans and collectors who research Disney comics and those stories by Barks in particular. According to this recent article in the German newspaper Die Zeit, Wollina joined D.O.N.A.L.D. 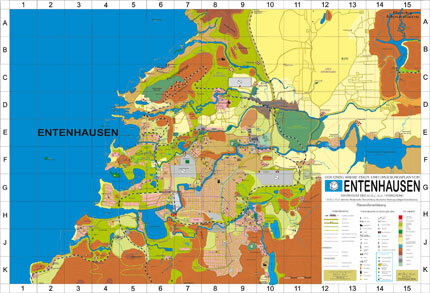 (an organization of Donaldists in Germany) in 1994 and shortly after that started work on the map of Entenhausen, which is how Duckburg is called in Germany. He was 47-years-old at that time. The map, which is based on hundreds of stories by Carl Barks, contains all famous places in Duckburg. These include the home of Donald Duck, Daisy Duck and Gladstone Gander, as well as the money bin of Uncle Scrooge and many other landmarks. All street addresses, names of bridges, train stations, statues, post offices and other landmarks have been meticulously taken from Barks’ hundreds of stories. 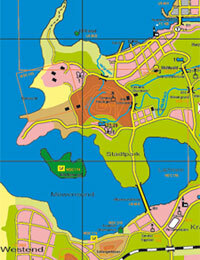 You can find more information about the map (in German) on the D.O.N.A.L.D. website where you can also order a printed copy. This entry was posted on Thursday, December 4th, 2008 at 2:18 pm	and is filed under Carl Barks, Disney comics. You can follow any responses to this entry through the RSS 2.0 feed. You can leave a response, or trackback from your own site. Very useful and awesome realization for any Disney Fans! The only concern is about the fact that for this map any single variation in the Carl Barks figurative representation of Buildings and houses has been considered as a different houses or building. So in this map plenty of Donal’s Houses are present ?!! as well as many Scrooge money Bins, and several Gladstone an Daisy houses ?!! spreaded all around the city. It is difficult to belive that the idea of Carl Barks was to place Donald or Scrooge or Daisy in a different houses or building in any story even if, of course, these were graphically represented with some differencies or with different back ground. Carl Barks simply did not care to represent the Scrooge Money Bin or the Donald’s house, Gladstone’s house, Daisy’s house, Gradma’ farm, Gyro’s lab…etc…. always exactelly in the same way and with the same design or back ground! What a waste of time! That’s not nearly correct – and besides, it doesn’t point out where they live. I wonder if the one who made it had any idea what this whole entity is.